A long tough day and as we approach Chjargas Lake the prospect of a cold beer is enticing. We have been warned that the first thing we should do, however, is make sure we have filled up with fuel from the tanker in camp. 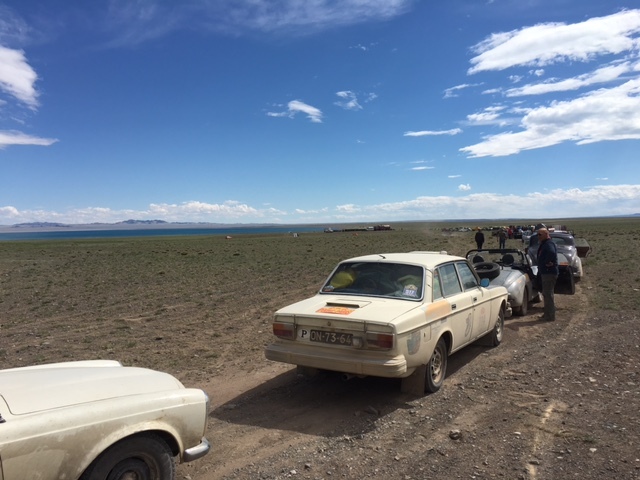 Unfortunately this was the queue – so long that it is barely possible to see the tanker in the distance. Given the long distances and lack of fuel in the Mongolian desert we have all installed massive double fuel tanks. Our is the norm for the classic cars of 2 tanks of 50 litres each but many of the 40’s Americans have 150-200 litres and the remaining La France has a 400 litre tank – and is in front of us. Matt stays with the car while I get us a beer, set up the tents, shower and eat. I then go and relieve Matt in the queue – where we have advanced roughly 4 cars. The old Mongolian guy serving out the fuel is, I am sure, doing it with a teaspoon but the weather is warn and sunny and it’s not unpleasant sitting in the queue. It turns out to be lucky that we did as stories get around of cars still queuing at 11pm before the fuel ran out. New supplies did arrive but some cars were getting refuelled at 3am.